Stephen Williamson: New Monetarist Economics: Central Bank Liabilities Part II: Currency, Negative Nominal Interest Rates, etc. Central Bank Liabilities Part II: Currency, Negative Nominal Interest Rates, etc. Central banks are indeed banks. As financial intermediaries, their social role depends on what a central bank can do that some private financial intermediary cannot, or cannot do as well. Fundamentally, financial intermediation is asset transformation - how the intermediary structures itself so that its liabilities have attractive properties as compared to its assets. In our changing world, central banks have to adapt their liabilities to evolving technologies and macroeconomic developments. My first installment on this topic was about new types of central bank liabilities - the idea that a central bank's reach could expand beyond supplying old-fashioned currency, with a focus on liquid overnight liabilities that reach into the upper levels of financial interaction, beyond retail payments. This installment will deal specifically with currency. Are paper money and coins going the way of the dinosuars? Should they? If we were to eliminate or significantly curb the circulation of Federal Reserve notes and coins in the United States, should the Fed issue new types of liabilities to replace them? What types of liabilities might work, and how should they be managed? You can find plenty of writing on this topic recently. Ken Rogoff and Larry Summers make a case that we should elminate large-denomination currency. Agarwal and Kimball, Kocherlakota, Goodfriend (new version), and Goodfriend (old version) discuss various schemes for either eliminating currency or making it more costly to hold. In contrast to Rogoff and Summers, who think eliminating $100 Federal Reserve notes, for example, will put a big dent in undesirable and illegal activities, the latter group of authors is interested in ways to effectively implement negative nominal interest rates. What does standard monetary theory tell us about how much currency we should have? The basic logic comes from Friedman's "Optimum Quantity of Money" essay - what's come to be known as the "Friedman rule." If the nominal interest rate on assets other than cash is greater than zero, then people economize too much on cash balances. Cash balances are costless to create, and economic forces will create the optimal amount of real cash balances if the central bank acts to equate the rate of return on cash to the rate of return on other safe assets. There are different ways to do this. One approach is for the central bank do whatever it takes to make the nominal interest rate on safe assets zero forever. Another approach, if feasible, is for the central bank to pay interest on cash at the nominal interest rate on safe assets. There are other approaches, but we'll stop there. How do we connect the Friedman rule with what people are saying about currency? Those people are saying we have too much currency, but the Friedman rule says that a zero nominal interest rate is just right, and otherwise (with nominal interest rates above zero) we have too little currency. Of course, there's a lot going on in the world that is important for the problem at hand, and is absent in standard monetary models. First, currency is certainly not costless to create. Real resources are used up in designing currency so as to thwart counterfeiters, to print and distribute it (think about guards and armored trucks), and to maintain it (taking in and shredding worn-out notes). Second, currency can be stolen. A virtue of currency is its anonymity - people will accept my Federal Reserve notes without worrying about my personal characteristics - but this also makes currency easier to steal than some other assets. Third, the use of currency implies social costs. Again, a virtue of currency is its anonymity, in that the existence of currency allows us to conduct transactions in private. In some ways, we might think this is consistent with democratic notions of individual freedom - we can conduct whatever transactions we want out of the reach of surveillance. But this anonymity also lowers the cost of carrying on domestic illegal activity, and international activity that might be harmful to domestic interests, which is what Rogoff and Summers are on to. The illegal domestic activity could be various aspects of the drug trade and organized crime, while harmful international activity might involve, for example, the international market in military weapons. Currency is a remarkably resilient payments technology. As I pointed out in my last post, the ratio of U.S. currency to GDP is as high as it was in the 1950s, and has risen since the beginning of the financial crisis. Though about 80% of the stock of Federal Reserve notes consists of $100 bills, currency still shows up in surveys of legal payments as an important transactions medium. As we might expect, this Boston Fed publication indicates that currency is used much more intensively by poor people than by the rich. The advantages of currency are obvious. It's easy to carry around (except if you want to buy a house or a car with it, for example); it comes in small denominations, making it convenient for small transactions; and it provides immediate settlement without the use of electricity (unless the other party in the transaction needs to open the cash register). So, any scheme to eliminate currency altogether faces significant potential costs. Unless an alternative low-tech payments medium can be provided, a lot of poor people (and possibly some rich ones as well) are going to be worse off. But Rogoff and Summers have a point - it's hard to see what the benefits of $100 bills are. In fact, there would not be much loss in convenience for legitimate exchange from eliminating $50 notes as well. The U.S. government, however, would lose part of the revenue from the inflation tax. How large is that? U.S. currency outstanding is about $4500 per U.S. resident, so a 2% inflation rate generates about $90 per person in seignorage revenue. If eliminating $100 and $50 bills reduced the stock of currency outstanding by about 70% (assuming that some of the existing demand migrates to other denominations), the loss would be about $63 per person, which perhaps is a small price to pay for putting a serious dent in criminal activity and terrorism. Thus, what Rogoff and Summers are proposing seems like a no-brainer. 1. Take as given that the most important role (at the extreme, the only role) for monetary policy is correcting the distortions arising from sticky wages and prices. That's a key assumption - none of these authors thinks it is necessary to defend that. 2. The real interest rate is low, for reasons unconnected to monetary policy, and is expected to remain low into the indefinite future. It's hard to quarrel with this, but the reasons for the low real interest rate could matter. 3. (1) coupled with (2) implies that, in pursuit of inflation-targeting and output-gap targeting, the central bank will in the future be encountering the zero lower bound (if indeed it is a bound) with greater frequency. 4. Once constrained by the zero lower bound, there are losses in economic welfare due to output gaps and departures from inflation targets. 5. Such welfare losses can be avoided, if only nominal interest rates can go negative - this relaxes the zero lower bound constraint. 6. There are no costs to negative nominal interest rates, only benefits. The hardline NK (New Keynesian) view, shared by Agarwal/Kimball/Kocherlakota/Goodfriend (AKKG) is that things that get in the way of the downward descent of nominal interest rates are an "encumbrance" that we are better off without. In this respect, currency just gets in the way. As the argument goes, a negative nominal interest rate on reserve balances will tend to make all safe short-term rates of interest negative. But for banks, there's a problem. The bank's assets are close substitutes for assets earning negative rates of interest, but its deposit liabilities are substitutes for zero-interest currency. So banks are squeezed - if they lower deposit rates, they lose small depositors; if they don't their profit margin goes down. What to do about that? AKKG argue that there should be programs put in place to make currency less desirable, thus giving bank depositors a poor alternative to flee to. In Goodfriend's 2000 paper he suggests a scheme for taxing currency - equip every Federal Reserve note with a strip. Whenever the note returns to a bank, the bank charges the accumulated tax since the note was last turned in, and deducts this from your deposit. Alternatively, Agarwal and Kimball suggest a scheme for a changeable exchange rate between currency and reserves. The current arrangement between financial institutions holding reserves and the Fed, is that reserve balances can be converted one-for-one into currency, and vice-versa (presumably with service fees added for armored trucks and such). Under the Agerwal/Kimball arrangement, during periods of negative interest rates the rate at which reserves can be converted to currency would decline over time to match the negative interest rate on reserves. The Goodfriend scheme seems problematic as, if the vintages of Fed notes ("vintage" meaning the time since the tax was last paid) are known, then notes should trade at different prices. This of course messes up the whole currency system, according to which the denominations are set up so that it's easy to make change - seems hard to do that if one note marked with a 10 trades at 97% of the value of another note marked with a 10, for example. All of these schemes will not make things any better for banks, who are in part selling a convenience to small depositors - the right to exchange their deposits one-for-one with currency, which these people find useful for making transactions. And people and firms are quite ingenious when it comes to getting around regulations. If a negative interest regime is in place for a long time (something of course the advocates don't imagine, but no one in Japan imagined they would have interest rates close to zero for over 20 years either), this creates profit opportunities for various types of cash hoarding operations. Hoarding cash is an activity subject to increasing returns. A financial intermediary could, in principle, set itself up as a simple currency warehouse, supplying safekeeping services, and make a profit in such an environment. Of course, AKKG, or people like them, could think up many ingenious ways to thwart such arbitrage schemes. The Swiss went to negative interest rates at the beginning of 2015. Since then inflation has also been below zero. Of course, monetary policy isn't the only factor affecting the inflation rate. There is substantial variation in inflation in the chart, but you can see the trend. 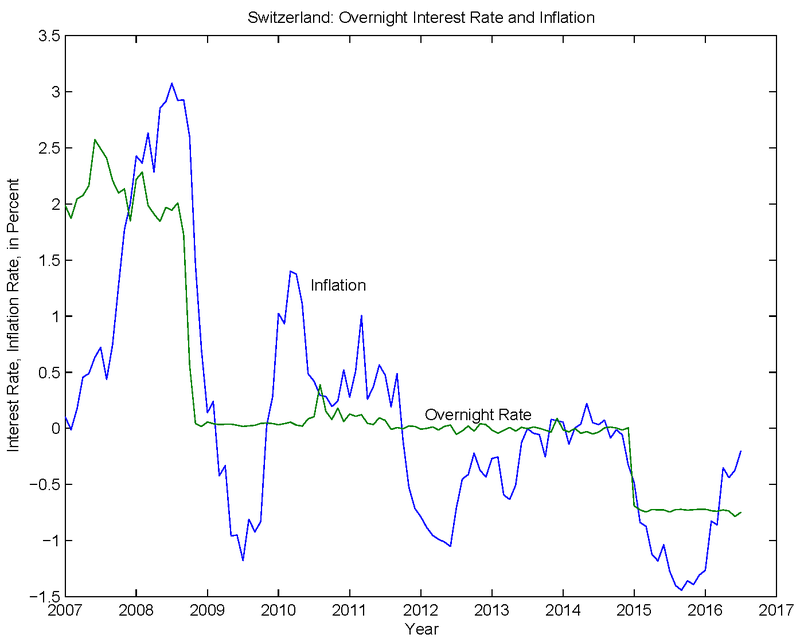 Negative nominal interest rates for 21 months in Switzerland are hardly making inflation explode. As is well-known, a belief that low nominal interest rates cause high inflation inevitably leads to self-perpetuating low nominal interest rates and low inflation. That's part of the force behind the negative nominal interest rate lobby. Surely, they think, pushing interest rates into negative territory will cure the low-inflation problem. Well, sorry, adding another hole to your shoe doesn't fix your shoe. But, the other motivation for negative nominal rates is stabilization policy. It may be true that a lower bound of zero gives the central bank less room to move when real interest rates are persistently low, but some people seem to find it difficult to reconcile themselves to the realities of the stabilization policy they claim to believe in. If we really think that moving a short-term nominal interest rate around has large real effects on aggregate economic activity, we have to recognize the need to make intertemporal tradeoffs. That is, we may think that lowering nominal interest rates confers some benefit, but we can't always be moving nominal interest rates down. Sometime they have to go up. Seemingly, a key principle of monetary stabilization is that it's less costly at the margin to increase nominal interest rates in good times than in bad times. Also, that it's of less benefit, at the margin, to lower nominal interest rates in good times than in bad times. Therefore, optimal monetary stabilization is about increasing interest rates in relatively good times, and reducing them in relatively bad times, while on average hitting an inflation target. Every time interest rates go up, central bankers are asking people to bear some short-term pain, in exchange for larger future short-term gains from lowering interest rates. Larry Summers, for example, seems to have a hard time recognizing this. According to him, we're in a long period of secular stagnation, which implies that we're in a relatively good state compared to the future. Further, Summers is very concerned with the fact that interest rates can't go down much if a recession happens. So, one might think he would be in favor of interest rate increases now, but he's not. Go figure. Just as wrongheaded inflation control can lead to perpetually low nominal interest rates, so can wrongheaded stabilization policy. People who are single-minded about stabilization always see inefficiency when they look at the economy. Things are never quite right, so there's always a reason to lower interest rates. Given these tendencies among policymakers, perhaps a zero lower bound is a good thing. It's a constraint that prevents well-intentioned interventionists from defeating themselves, in terms of their own goals. Where does this leave currency? Rogoff and Summers seem to have good arguments for getting rid of large-denomination currency. Getting rid of all currency, or making its use more costly seem like too high a cost, given the likely benefits of negative interest rate policy - about which proponents seem pretty confused. Central banks should, however, be thinking about electronic alternatives to currency. Blockchain technologies are potentially useful, and could be tied to the decentralized transfer of central bank liabilities. There are private alternatives to currency, for example Green Dot provides stored-value cards that are not tied to checking accounts. Would it be a good idea for central banks to issue stored value cards? In any case, we're not there yet with these alternative payments technologies so, for the time being, currency is a convenient low-tech payments instrument that we should keep. "...and Larry Summers make a case that we should elminate large-denomination currency. " 1. status quo, i.e. continue to print $100 bills. 2. moratorium - that's ceasing to print $100 bills (possibly temporarily), but we don't do anything to take the existing ones out of circulation. 3. "get rid" of $100 bills. Stop printing $100 bills, and tell banks that they have to return any $100 bills they acquire to the Fed. For example, when Canada issued loonies and twoonies, they did #3 - old $1 and $2 notes were retired, and you don't see them anymore. Same thing with Canadian pennies. As you say, if you do #2, then it's possible that $100 bills will actually circulate at a premium. In practice, the Fed maintains circulation at par for all denominations by satisfying all demands by reserve account holders for withdrawal in denominations of their choice, and it stands ready to exchange 10 fives for a fifty, for example. If the Fed does #2, then the $100 bill could exchange in the market for 15 tens, for example. Same thing could happen with #3. What happens then? Eventually the old $100 bills wear out, but presumably they're not circulating much, so that could take a long time. But, over time, it becomes easier to counterfeit a given vintage of currency. So, eventually, the counterfeiting technology catches up, and the existing $100 bills outstanding become worthless. Yes, that sounds right to me. One thing. If the Fed chooses #2, it would freeze the stock of $100 bills in circulation but could potentially offer free 1:1 exchanges of worn $100s for fresh ones. This would keep the stock of $100s from growing while also reducing wear and tear, making it harder for counterfeiting technology to catch up. Another thought: If #3 is chosen, and the existing stock of $100 bills is sufficiently contaminated by counterfeits, 100s could be exchanged at a discount. If the discount is sufficiently large, it's advantageous to trade in your good $100 bills - so long as you know they're good. The Fed knows the difference between good and bad, but the market doesn't. This just further degrades the average quality of what circulates, and deepens the discount. "... inflation rate generates ... seignorage revenue." I've been in rooms full of monetary theorists who can't agree on what seignorage revenue is. Give me your definition, and tell me why that's right. This is one of many areas where it is preferable to take a pragmatic (rather than essentialist, if I may say) approach. The central banks does some things and other things result. Worrying about how to label it is secondary. Of course, if helps if people know what other people are talking about when they speak. But that is just a matter of convention. The convention most widely accepted is the "right" one, I guess. It seems to me that your are right that there is no clearly dominant convention here. I thought Jordi Gali did a pretty good job of being clear in his (favorable) review of h money, although I don't share his view of h money. The unspoken assumption here (which many be an assumption that follows from the sticky wages/prices thing, not the authors views) is that deflation itself is unacceptable under any circumstances. Even if those circumstances include a negative nominal rate to avoid a dangerous rise in real rates under deflation with a ZLB. The problem with this view is much like the argument given in the article that for rates to be able to come down at some point they have to go up. Unless we sometimes have deflation then the banking system can only create deposits but never destroy them. Anyone who holds that deflation and deposit destruction (via NNR) cannot (be allowed to) happen is also in essence arguing in favour of an ever-downward trajectory for interest rates. Which is paradoxical, if the ZLB is held to be sacrosanct. At some point you end up with a savings glut if deposit destruction can't happen. Do we really know how stick wages and prices would behave under deflation with an appropriate NNR of interest? I don't think we do, because its never been tried. "...is that deflation itself is unacceptable under any circumstances." That's not my assumption. Some people think that deflation is some kind of black hole that we want to avoid at all costs. Some people also think you get in the black hole with high nominal interest rates. As far as I know, that's never happened. So is your point that a higher nominal interest rate might avoid deflation, or that it might be better than current policy regardless of the (short term?) effect on deflation/inflation? Having read your post I'm not clear which of the two it is or whether I'm totally barking up the wrong tree. Lower nominal interest rates tend to make inflation lower. So if the central bank has a 2% inflation target and is undershooting, negative interest rates won't help. I know that's not what is usually claimed (it's typically thought that lower interest rates make inflation go up), but I disagree. As to what the optimal inflation rate should be, that's another question. You can certainly make a case that predictable inflation is a good thing, but whether 2% is better than 0% or 4% is something that no one could tell you with any confidence. Deflation is sometimes regarded as a potential disaster, but I don't think that's correct either. "So, any scheme to eliminate currency altogether faces significant potential costs. Unless an alternative low-tech payments medium can be provided, a lot of poor people (and possibly some rich ones as well) are going to be worse off... &... In any case, we're not there yet with these alternative payments technologies so, for the time being, currency is a convenient low-tech payments instrument that we should keep." I'd argue something like mobile money (ie issued by telecoms) can do this by leapfrogging banks. In Africa for instance you see products like Safaricom's mPesa growing in popularity. Should the private sector or the government provide mobile money? I'm not sure. mPesa illustrates that the private sector can do the job splendidly. On the other hand Ecuador has recently unveiled a central bank-run mobile money scheme. "AKKG argue that there should be programs put in place to make currency less desirable, thus giving bank depositors a poor alternative to flee to." Can we include Kocherlakota in that group? My understanding is that he'd prefer abolishment over making currency less desirable. Private cryptocoins like Zcash would replace cash by providing anonymity services. "The Goodfriend scheme seems problematic as, if the vintages of Fed notes ("vintage" meaning the time since the tax was last paid) are known, then notes should trade at different prices." That's his old paper, but Goodfriend's new paper seems like an improvement. Instead of cash with a strip, he proposes a currency card linked to an account, sort of like a bearer instrument or gift card. Sounds similar to your Green dot idea. I think that solves the fungibility problem, no? I'm partial to Goodfriend's 5B option; just let the deposit-to-cash price float. It would function much like Summer's moratorium. To add to your taxonomy of schemes for encumbering currency, my idea is a progression of 'note embargoes' Begin by putting a moratorium on $100s so that their price floats. Because smaller bills cost more to store, you've effectively ratcheted the lower bound down a bit. If you need to reduce rates further, then float the price of $50s. Then go to $20s, etc, until everything is floating, at which point you have Goodfriend's 5B. A staged series of moratoriums rather than one all out moratorium would be more easy for society to get used to. Small bills, the ones that regular people use, will keep their peg to deposit money, unless of course rates need to go very low. Of course, note embargoes and negative rates only make sense if the neo-fisher critique is wrong, as you point out. I'm open to having my mind changed; just haven't heard the killer argument yet. 1. mPesa is somewhat related to Green Dot. It's tied into the conventional banking system, though the technology is different. 2. Kocherlakota: abolishing the stuff is the extreme case of "making it undesirable." 3. Killer argument: Personally, I'd like to see all these schemes implemented, so we can watch what happens. My prediction is that this will demonstrate the folly of all this stuff. I have an additional question about Goodfried's proposal. A negative interest rate is defined over your deposits over a period of time. With the strip, how can the bank know how long you kept the dollar bill for? In any case, I am stunned with the proposal. If I understood Goodfriend correctly, the idea is that the Fed would keep an electronic record for each of the notes in circulation. Then, when notes come in, the accumulated tax on each note is paid - that is, the accumulated tax since the last time it was paid for that particular note. The Fed could get the private banks to collect the tax. Alternatively, the accumulated tax could be paid when the notes wear out and are sent back to the Fed. I think you can imagine what the problems would be. Yes, I do. That's what I was getting at. If a bill changed hands several times without being redeposited for a while only the last person would pay the tax, even if he had held it for a few hours. So the incentive would be to never deposit it, especially if individuals don't know how long it has been in circulation or when it was deposited last. Stephen, why are we paving the way for negative rates in the first place? Wouldn't a need for negative rates signify a failure of monetary policy to boost NGDP growth? Negative rates accommodate and reflect tight monetary policies! I would have imagined that printing currency is a time-honored means of boosting NGDP. Higher interest rates would be a symptom of successful stimulus. Isn't this the measure of success? Shouldn't the central bank print more currency, not less? We cannot even know what the public demand for currency is, when banks are forced to quasi-criminalize cash holdings at $10,000. Eliminate these quotas on cash formation, and you just might see currency volumes bloom, with NGDP following, and rates and employment rise. BTW, the 1950s and present are not compatible for currency. Half of the US currency base now circulates abroad, with no nexus to US NGDP. That's where most of the $100 bills are. Also, please spare a word for the benefits of private spending decisions, not to mention the layer-upon-layer of fees and costs levied by banks and credit card companies. Cash is cheap to transact, and we all have spending that we'd like to keep under the radar. I hope you got the idea that I'm not paving the way here. I can't see anything but a downside to negative rates. An interesting anecdote is that Marvin received death threats when he first floated the idea in the 1990s (I was in grad school at the time, and he was giving a talk shortly after the whole thing blew up). People are nuts. Yes, I heard that too. That's the privacy issue. For some people, this is in a ballpark with the 2nd amendment. We are going to take something away that you find useful and value, and force you to use a system we control, so that we can better manipulate the system in ways that we see fit. You should just accept this and go about your lives because we told you it is a good thing. The guy that gets upset at this is the one that is nuts (this is not meant to justify death threats, but most normal social interaction would teach you that taking something away results in strong reactions. Americans generally don't like the government tampering with their currency, weights and measures, etc. Sometimes that resistance is a bad thing. We still have pennies and paper $1 notes, for example. I have written about the dangers of a cashless society. Even the Riksbank is against total cashlessness. Summers wanting to get rid of 100 dollar bills is just a start, and he couched the idea in terms of crime, not NIRP. That was disingenuous. But think about it prof, if people want to hide money at home, they want big bills not bills that take up a lot of room. That will invite crime, the opposite of what Summers claims he wants. But really, his pitch against crime is not his real reason for wanting to abolish cash. It is a start on the road to cashlessness. If it wasn't it would not have made the evening news. Hardly any monetary policy makes the evening news, but Summers did. That is scary. Kimball is sneaky, thinking he has a moral persuasion for making cash less valuable than digital money. He says it would do away with the need for inflation. But if you ask me, it is a denial of money to people who need it most, who function in a cash society. Flea markets, pawn shops, yard sales operate with cash. People don't want to pay a transaction for digital money for those little purchases. That is just stealing. But the Fed has stolen interest from retirees, so I am sure they don't really care. But Kimball has taken an immoral position and has tried to make it moral. I am happy you care, prof, but I think you are in the minority. Keep fighting the good fight against cashlessness! At my name I have the Miles Kimball article if anyone wants to read it. Did you learn anything from that? Disappointed to see you are not active on the blog these days. I trust you got good big things going on. Can you comment on the BOJ move today? How does it fit in an NF model? Their target rate for the 10 year bond is technically higher, but can you get inflation by targeting a long term bond to zero? Do you have concern that the dual targets (negative interest rates in the short term, zero rate on the 10 year bond) will lead to major arbitrage positions in Japan? Targeting the 10-year bond rate looks like window-dressing. Basically, they're promising more of the same. What good is a promise that inflation will exceed 2%, when you can't get to 2%? 2% is arbitrary. There's certainly no exacting science that tells us the optimal inflation rate is 2%. But, once you choose it, it's important to stick with it. People need to think that 2% forever is what they'll see. If you change it, who says you're not going to do it again?